TC1000 H BASE. SUPPORTS UP TO 105 KG. Wheeled base leg is 39cm wide. Brakes on each wheel. 168 CM 5'6" high and can extend to approx 209 cm 6' 10.5". These are in used condition. 6 x Unicol X-Bases (most have wheels removed for greater stability). 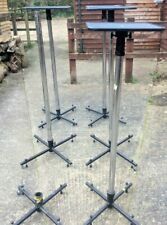 5 x Unicol Single Poles. Industry standard, high durability stands from Unicol in Oxford. Far better than the lightweight Chinese copies.